This creamy quick-to-fix pasta dish is sure to become a new weeknight classic. Drain pasta mixture; return to pan. Add pasta sauce; mix lightly. 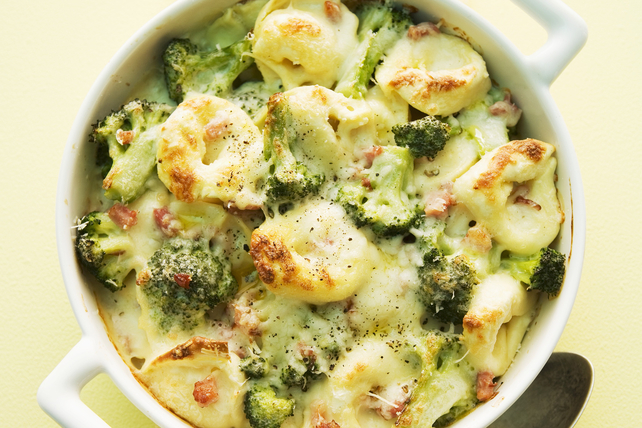 Spoon into 2-L casserole dish sprayed with cooking; top with cheese. Cover. Bake 20 to 25 min. or until heated through. Remove from oven. Heat broiler. Broil casserole, uncovered and 4 inches from heat, 3 to 5 min. or until cheese is lightly browned. Stir 1/3 cup crumbled cooked bacon into pasta mixture before spooning into prepared casserole dish, topping with cheese and baking as directed.